125 people pledged $10,208 to support this project on Kickstarter. 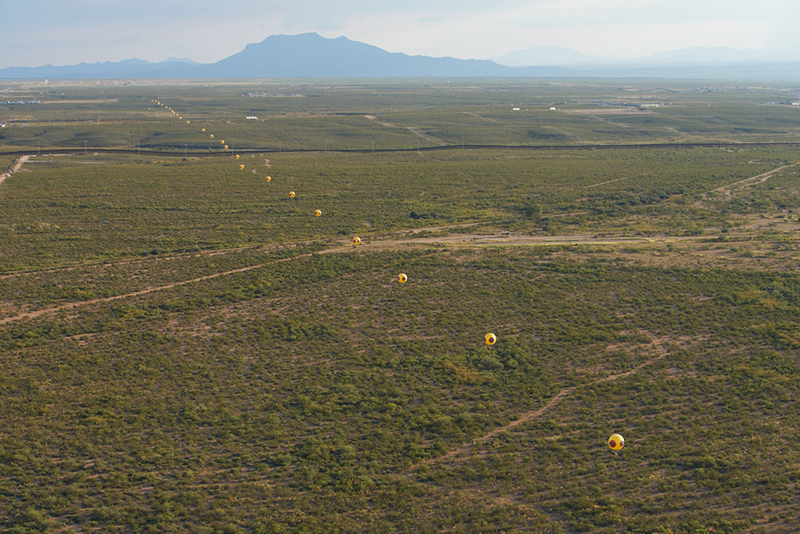 Postcommodity, Repellent Fence (2015), land art installation and community engagement (Earth, cinder block, para-cord, pvc spheres, helium). Installation view, US/Mexico Border, Douglas, Arizona / Agua Prieta, Sonora. Image Michael Lundgren, courtesy of Postcommodity. Postcommodity consists of Raven Chacon, Christóbal Marínez, and Kade L. Twist. Postcommodity, Repellent Fence (still from video), 2015. Image courtesy of Postcommodity. Postcommodity, Repellent Fence (2015). Image Lynn Trimble, courtesy of Postcommodity. Postcommodity, Repellent Fence (2015). Image Michael Lundgren, courtesy of Postcommodity.